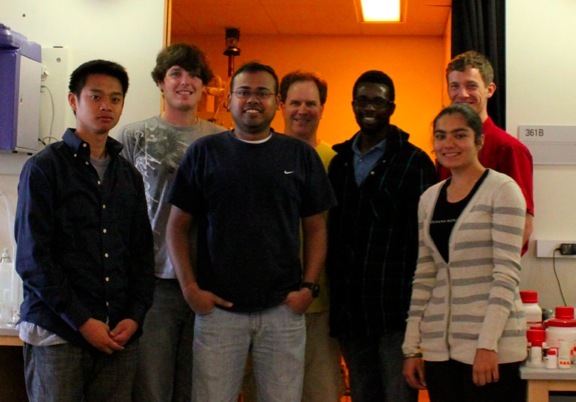 Welcome to the Menke group at UC-Merced! We are a materials chemistry group in the chemistry department interested in new materials for solar cells and batteries. Congratulations to Justin Hujdic for his successful dissertation defense! He and Somnath will be working at IBM. Congratulations to Somnath for his successful dissertation defense. He will henceforth be known as Dr. Ghosh! Our lab was recently profiled in Merced’s Downtown Life Magazine. You can read about our research, or take a lab tour. This paper describes a low-cost method for preparing arrays gold nanowires coated with either copper-indium-diselenide or lead selenide, as well as some of the interesting and unexpected optical behavior of the nanowires. One of the problems with the LPNE method is that while we can synthesize nanowires using photolithography and beat the diffraction limit of light, the photolithography does dictate the nanowire pitch. This paper describes a method for preparing arrays of nanowires with a nanowire spacing that is dictated by electrodeposition, rather than photolithography. Lead selenide is a small bandgap semiconductor with applications in IR detectors and mid-IR lasers, as well as an interesting model system for studying quantum confinement effects. Here we describe a scalable process for preparing large arrays of PbSe nanowires, as well as their electrical properties.